Make the easiest holiday wreath to last through Christmas and beyond! 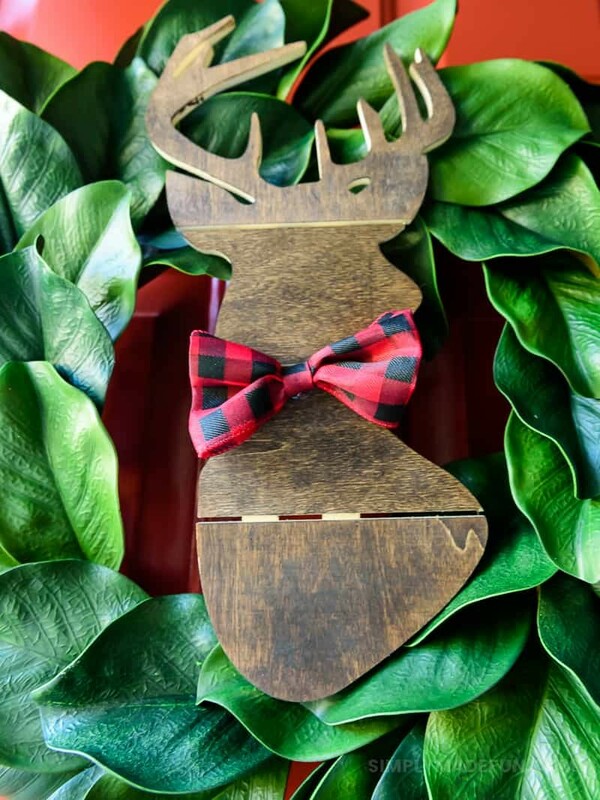 All it takes is a little bit of greenery, wood, and the perfect buffalo plaid ribbon to give your front door a little holiday style. I’ve got a unicorn on the blog today. A FREAKIN’ UNICORN. It’s a craft made completely without the use of my Silhouette machine. I know, I know. Who AM I right now? I don’t even know. But I am SO excited with how this holiday wreath turned out because my door needed a little bit of an upgrade. I’ve had this green wreath on my door (from Hobby Lobby!) since we moved in back in August and I couldn’t look at it anymore without thinking that it was lacking. It wasn’t festive. It wasn’t jolly. It was just plain. You can probably tell I go to Hobby Lobby a lot. At least once a week….sometimes a little longer if I can hold off (I usually don’t have that willpower). And the last time I was in there (early December) they were taking down all the Christmas stuff already! I was bummed. But luckily I found a cute little deer in the wood aisle and knew that I needed it. I could dress it up for Christmas OR I could use it for after the holiday. I didn’t really know what I was going to do with it, I just knew I needed it. So I took it home and let it sit on the floor of my craft room for a week. And one afternoon during nap time I sat in my office starting at a gigantic roll of buffalo plaid ribbon and had an idea. And I knew just what I needed to do with the deer. And that’s how I came up with the easiest holiday wreath, ever! + Stain your deer and put it off to the side to dry (I let mine sit overnight, but it was really dry after 10 minutes). 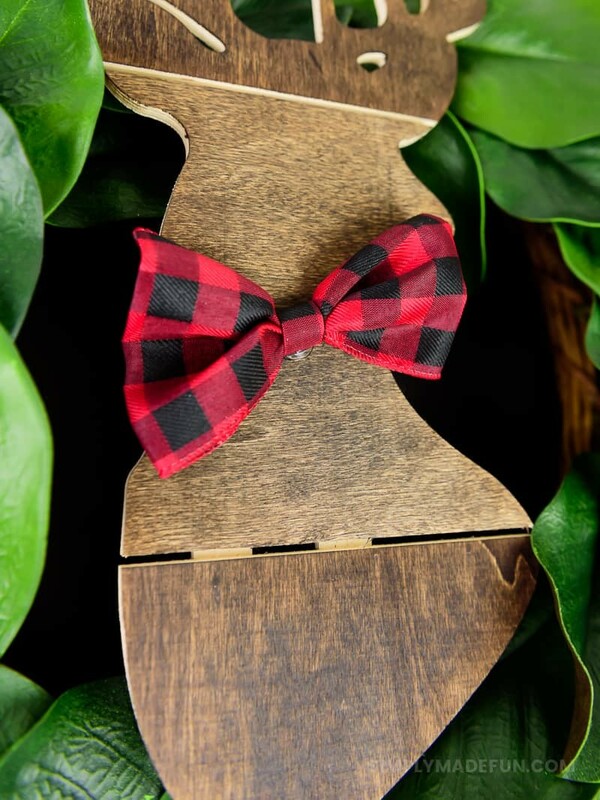 + Grab your buffalo plaid ribbon and make a bow tie. I used the same tutorial for the bow from the Rae Dunn Ornaments. + Once your deer is dry put a light layer of polycrlic on it. This is especially important if you’re putting it outside, because the polycrylic will protect it from water. + When that layer is dry, hot glue your bow on the deer. 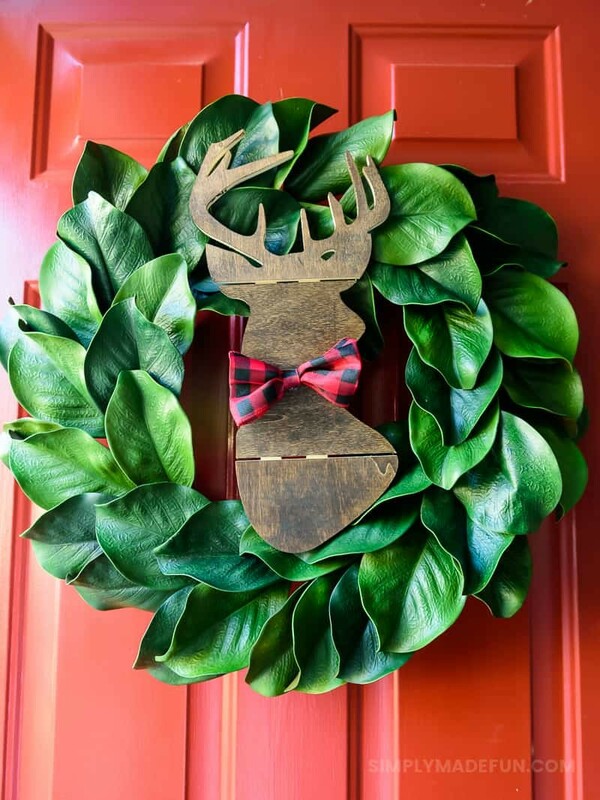 + Then use the floral ribbon to attach your deer to the wreath. I know it seems like a lot of steps but really…this could not have been easier. The longest part of this craft is the waiting while everything dries, and even that didn’t take too long. If you want to make it more for Christmas you could add some lights or maybe a big bow on the wreath, but I chose to keep it simple so I could leave it up after the holiday. I don’t have too many things that are winter-themed, but I did make a few things last year that I love! I love how this wreath turned out! My Christmas wreath this year is kind of lame but oh well, I’ll try to do it better next year! You know how life goes with a toddler haha! hahaha who has time to do anything when you’re running after a toddler?! 😉 I’m sure your wreath looks super cute!